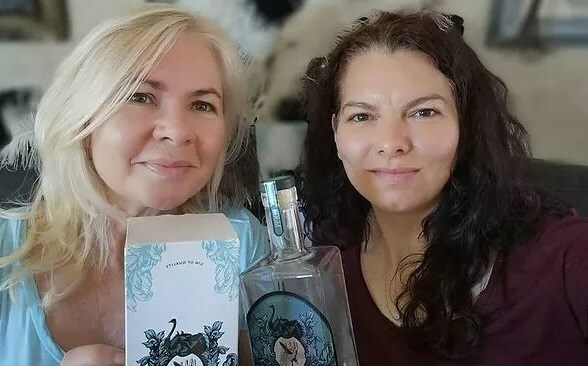 Business partners and real-life partners; Stella Kruger and Colleen McCloy have only just launched a fresh new gin under the brand McKruger Spirits. 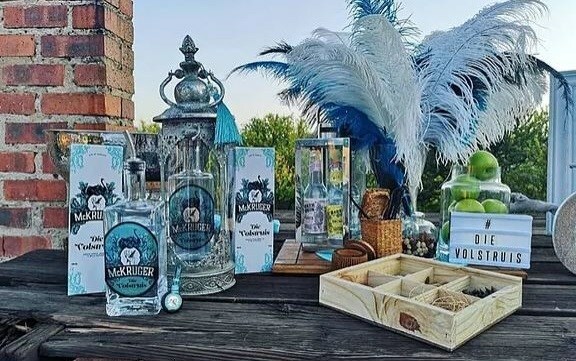 Die Volstruis or the ostrich gin is a whimsical spirit that doesn't take itself too seriously and yet at the same time manages to bring superb quality and taste all at once. The beautiful bulky, square bottle with a stunning green label designed by a friend holds a finely crafted gin that I am officially a fan of. The gin itself does comprise some unique botanicals including; wild pepper, green apple and vanilla which come together to create a fresh and summery symphony that is extremely versatile. Speaking to Kruger about the gin, she indicated that different people smell different notes on the gin at first. Mine was green apples on the nose. One sip gave me a warm, peppery taste that was not overwhelming or too spiced. And finally, after the addition of a block of ice, the neat spirit somehow became sweeter for me, which I found mind-blowing. What makes this gin so unique? Well apart from these unusual botanicals, Die Volstruis is currently cold distilled which Kruger says, "adds a more unique aspect to the flavour profile." Regular distillation temperatures occur at about 78 degrees whereas cold distillation, which takes place in a vacuum system, occurs at only 28 degrees. This means that the botanicals are not boiled, preserving the flavours. The apples and vanilla pods are also added to the still entirely fresh. They did initially try to distil with dried apples but Stella's scepticism and desire for a fresh and summery taste paid off. They moved over to fresh apples and the taste was so noticeably better that they have not gone back. Stella’s surname is Kruger - truly South African and Colleen McCloy - Scottish so combined McKruger which they both thought had a lovely ring to it. It was Kruger’s firm belief that, "if we made a gin, it was to sound South African. I didn’t want it to sound like we were from another country. It must be proudly South African." Once the name was decided upon, they then had to choose an animal to represent them. Looking into South African animals, Kruger didn’t want to settle on one of the more obvious ones but instead something unique and awkward which was how they selected the ostrich. Also being proudly Afrikaans, Kruger opted to keep the name in Afrikaans which she believes will do well with international tourists as they will be able to take a wholly South African gin back home to show others. Die Volstruis sources its botanicals from some rather interesting places including the wild pepper and vanilla pods from Madagascar. The green apples are from local farmers as it turns out, Kruger comes from a farming background herself. These are all experimental but do not fear as very small quantities will be stocked in their shop. McCloy is the cook and loves to mix and match flavours more by feel which is also how they decided to approach their gin distillation rather than by scientific distillation which I feel also accounts for the uniqueness of their gin. When asked what their perfect serve was, Stella surprised me by stating that there is none for this gin. "Because none of us has the same palette, I want people to go wild with the flavours." From curry bush to cucumber and ground pepper and even basil, this gin is one that allows itself to be experimented with. "We also wanted to make a gin that you can drink all day long, not just one of. You can change what you serve it with each time so it’s fresh and new each time." I think that they have achieved something extremely unique here because of just how flexible their gin is. Kruger’s immersion into the art of distillation was quite an odd one which began six years ago when she was working for a potato farmer. The owner had two sons who were still in school, but who had not only noticed a substantial amount of waste in farming, but also had an eye for alcohol. After much convincing, their father agreed and they began the long set up to distil. Once they had received trademarks, Kruger’s passion for distillation only grew from there. It was at that point that she asked herself, "why don’t we just do gin. I love gin!" and from that point, they began playing around on their own spirits. Without much start-up capital, it had to begin in a small kitchen at night. They would come home from work, quickly eat something and whilst distilling at the same time and this was how they grew and moulded their product for two years. Eventually when they felt ready, together they explored various distilleries where they were encouraged to just go for it and that they did! Today, McKruger spirits is a beautiful brand that is already on the rise. Although their heart is quite different to that of most distillers, they want to stay true to themselves, and not just make gin for profit but for the love of it. McKrugers will make gin small batch, not only for the demand and exclusivity but also because they want to maintain their joy and love for distilling. "I want to get up and go to work and it doesn’t feel like work," explained Kruger. There will be more gin coming our way, so keep your eyes on McKruger Spirits! 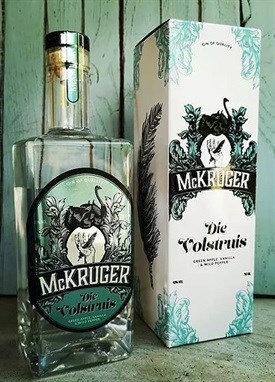 Die Volstruis is still extremely exclusive so the best way to get yourself a bottle is by contacting McKruger directly.